Senegal and Guinea will both prepare in Morocco for January's Africa Cup of Nations finals. 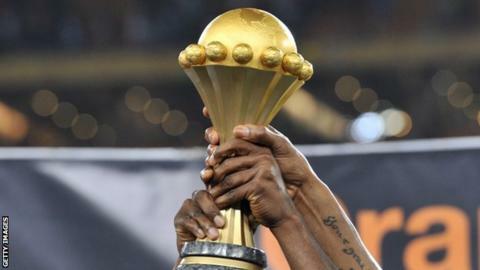 Guinea, who played their home Nations Cup qualifiers in Morocco after being banned from hosting matches due to the outbreak of the deadly Ebola virus, will be based in Casablanca. The Teranga Lions, who will name their squad on 26 December, will hold their training camp in the town of El Jadida. The two nations are due to play each in other in a friendly on 13 January. Both sides have other friendlies planned while in Morocco - Senegal are set to face another Nations Cup-bound side Gabon, while Guinea will play the Moroccan Under-23 side on 10 January. The Syli Nationale, making their 11th appearance at the biennial championship are in Group D with Cameroon, Ivory Coast and Mali. Morocco had been due to host the Nations Cup finals but had the tournament taken away from them after asking for a postponement because of their concerns over the Ebola outbreak in West Africa. Hosts Equatorial Guinea are already preparing in Portugal with 15 locally-based players set to be joined by their foreign-based stars in the coming days. The Nzalang Nationale will stay in Portugal until just two days before they kick-off of the finals on 17 January against Congo-Brazzaville in Bata. They will then play Burkina Faso four days later before completing their Group A campaign against Gabon. The president of the Equatorial Guinea Football Federation, Domingo Mituy Edjang has refuted media reports that Spanish head coach Andoni Goikoetxea would be sacked before the finals. Reports had suggested that Goikoetxea could be replaced by either Nigerian Stephen Keshi or former Ghana coach Milovan Rajevac. "We cannot replace a coach within one month of the Africa Cup of Nations," Edjang told the Confederation of African Football website. "We have a contract with the current coach which ends on 31 December, but will be extended till the end of the Africa Cup of Nations."